Since 1984, CAEL has worked with employers to design and implement employee tuition assistance and career and educational advising programs. In recent years, CAEL has seen growing employer interest in prior learning assessment (PLA). PLA helps their employees earn credit for college-level learning acquired outside of the traditional classroom, which saves both time and money in meeting educational goals. This CAEL research brief, produced in partnership with Prometric, presents highlights from conversations with 19 U.S. employers representing a range of industries on the topic of PLA. 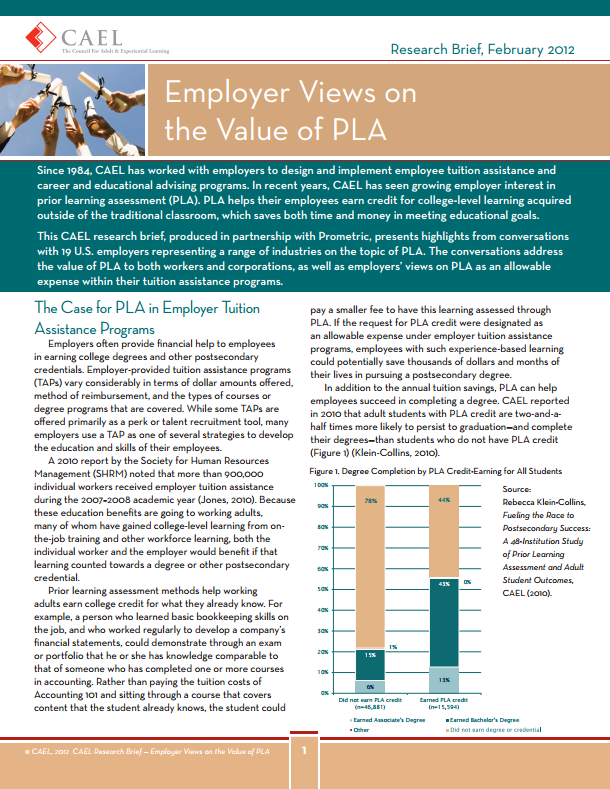 The conversations address the value of PLA to both workers and corporations, as well as employers’ views on PLA as an allowable expense within their tuition assistance programs.